The № 519 plays from network-connected devices and drives including NAS, using its Ethernet wired and Wi-Fi wireless connections. It contains a slot-loading disc drive for enjoying disc collections of standard Redbook and MP3 compact discs. 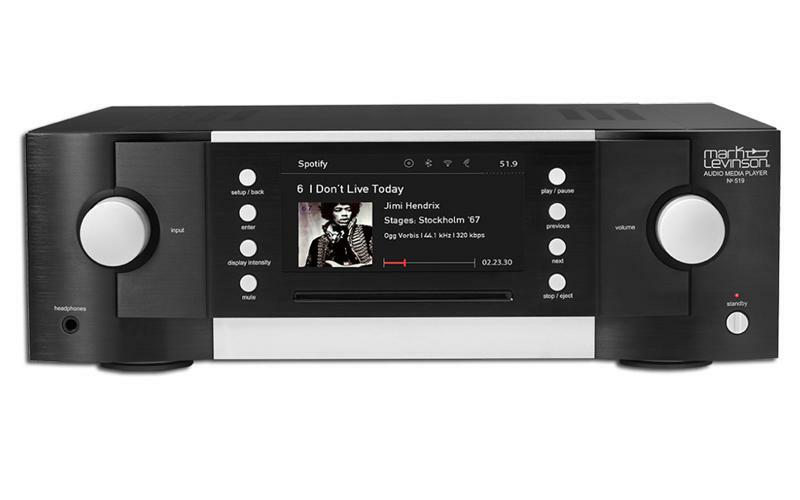 A full complement of digital inputs enables connection of external digital music sources, including an asynchronous USB connection for streaming high-resolution PCM, DSD, FLAC, ALAC, WAV, MP3, AAC, WMA, OGG, APE, AIFF, and WMV files from computers; and a Bluetooth receiver with the aptX AAC high-quality codec enables convenient, instant wireless music connection from virtually any handheld, tablet, or computing device. Two additional USB ports enable local connection of hard drives and thumb drives. With all of these methods for accessing and playing music, the № 519 is truly the music player the world has been waiting for. With so many connections and capabilities, the № 519 requires a beautiful, easy-to-understand control interface. To create a best-in-class user experience, designers started with a large five-inch, full-color TFT front-panel display flanked by eight aluminum buttons and the iconic Mark Levinson twin-knob controls. Following a series of design studies, designers created a gorgeous design style for all states and modes, that suits the № 519’s place within Mark Levinson systems, yet looks to the future in terms of detail and resolution. And thanks to its powerful [Name TBD] embedded Linux computer, the № 519’s display is always quick and responsive.